The Wall of Sorrow is the area available if you take the upper path from the Split. This is just one of three locations you can visit from the Split, and all of them lead to slightly shorter levels -- there are only 15 screens instead of 20 in the Wall of Sorrow. But, the Wall leads to an even greater challenge. The SS Exodus is at the top of the wall, and the Wall makes things challenging by turning your normal progression on its axis. You'll be climbing instead of going left-to-right. Check out where to get everything you need for 100% completion with the locations below. Cartridge #5: Wall of Sorrow 9 - Found in the upper-left passage. Jump through the spikes to find this path. Just below the secret entrance to the Wall of Sorrow 9 Mega Tumor. Secret #1: Wall of Sorrow 2 - Ride the spike walls and reach the top of the screen, then wait for the spiked wall to move further right until a passage opens up on the upper-left corner of the screen. Secret #2: Wall of Sorrow 3 - Tricky. Start from the end (upper right corner) of the level, and hang from the handhold. Drop and hold right to land on the ledge below. Secret #3: Wall of Sorrow 7 - Through the key door, visible on the left side of the screen. You can use the skull bird to hop to this area. Secret #4: Wall of Sorrow 9 - Very tricky to reach. This is on the upper-left corner of the screen. From the left passage with the spikes that leads to the cartridge, bounce off the skull bird to reach the handholds and jump up through the top. Secret #5: Wall of Sorrow 14 - Ride the very first cloud down to the handhold underneath the bottom-left corner platform. Touching the handhold causes a secret path to reveal. Wall of Sorrow 1: Simply drop down from the highest single block. Wall of Sorrow 2: Make a long jump from the moving platform to reach the tumor on the right. Try to retain one of the crumbling blocks -- you'll need it to ledge-jump back to the entrance. Wall of Sorrow 3: Enter the narrow spike-path in the upper-left corner. Nothing special about this one, it's just a dangerous detour before the exit. Wall of Sorrow 4: At the start, you'll see a ghost with the tumor floating left. From the start, wait until the ghost is very close, then step on the right-most edge near the start. The block will begin to fall. Time it right and that tumor is all your's. Wall of Sorrow 5: Jump up and down on the center cloud to get enough height to reach the tumor floating near the spike ceiling. Wall of Sorrow 6: Ride the lower-right most cloud down to grab this precious tumor. Wall of Sorrow 7: Draw the skull bird close and then hop / ride it up toward the key door on the left side of the screen to reach this tumor right from the beginning. Wall of Sorrow 8: Start from the end, using the last cloud to float down and hop over to the tumor, locating just beneath the exit. Wall of Sorrow 9: Jump on the single right-most block in the level to cause one block to begin falling. Use it to reach the seemingly impossible-to-reach tumor. Wall of Sorrow 10: Floats near the end around the spike ceiling. Get it when you jump to the last floating platform. Wall of Sorrow 11: To get this one, ride the platforms up to the upper-left corner, then drop down using the left handholds and exit back through the beginning of the level for a checkpoint. 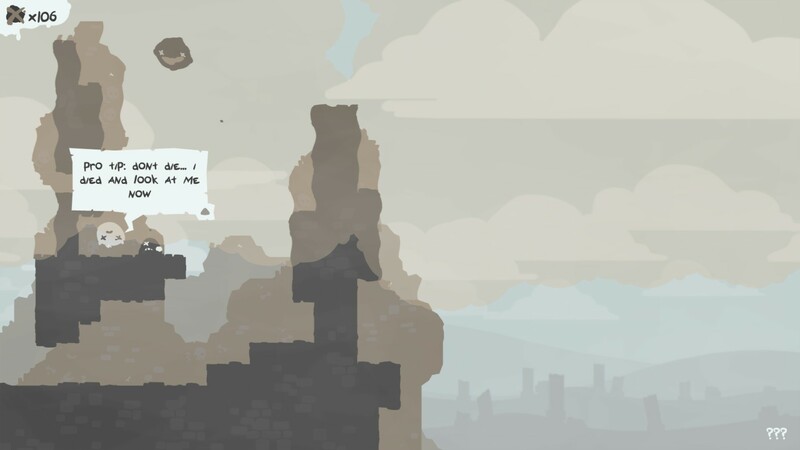 Wall of Sorrow 12: When you hang from the center spike block, it will begin to float up into the polluted cloud. If you hang off the block to get the tumor, you'll die -- jump and drop down to spend the least amount of time in the gas cloud. Wall of Sorrow 13: Just jump to the upper left corner -- but there's a big problem, you'll have to drop down and redo the end of Wall of Sorrow 12. Very annoying. Wall of Sorrow 14: Drop into the hole in the bottom-left corner of Wall of Sorrow 15 to get this tumor. Wall of Sorrow 15: Hop onto the first floating pillar handhold (it begins to rise upward when you land on it) and switch to the left side. Jump left to get the tumor, but try to land around the beginning for an easier checkpoint. The Wall of Sorrow path takes us to the SS Exodus. That's what we'll tackle next.